Well, well, well….it started so well. We kept Barcelona out for 45 mins and did quite well and even created a few chances of our own but in the end they were just a lot more clinical then us and pretty much won the tie in ten minutes. Rewinding to the start of the day, the tension and excitement had been building but my attitude was always as such ‘ we’re lucky to be here after our performance in the first two group stage games so let’s just enjoy it’. Normally, we find ourselves struggling in the league by now but being two points off top spot, the Champions League provided a bit of a distraction despite it being a glamour tie. We could genuinely try and enjoy it but know that our real focus should be on trying to become Champions of this country. I would say there was a relaxed atmosphere around North London before the game and even Pat Rice who was spotted driving past on Hornsey road seemed calm – good old Pat Rice! The lightshow that is becoming custom on big games was once again on full display and to be fair, it worked against Bayern Munich and against Manchester City so at least we are still 2-1 up on that one this season! 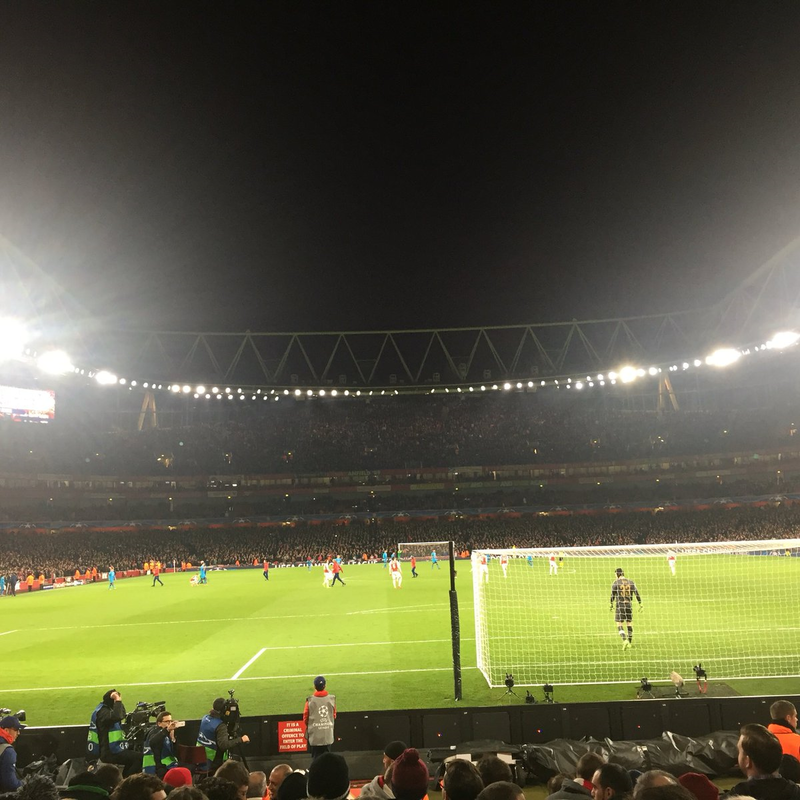 Atmosphere at times is a major problem at Arsenal and across grounds in England and what I find amazing is the people that criticise the card /bag display and lightshow. 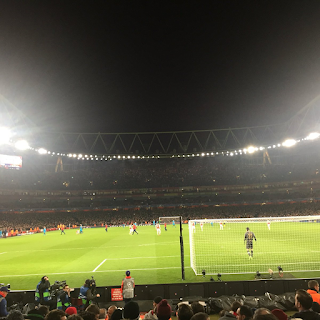 It is arranged by a fan’s group and paid for by Arsenal so I really do not get the problem. It is not costing us, supporters, a penny. I think supporters need to take responsibility by creating an atmosphere by chanting / singing but anything the club and fan’s group can do to improve atmosphere should be encouraged and applauded. The game itself wasn’t too bad and Arsenal did quite well, we had an obvious tactic to press to the half way line and it worked quite well but something seemed to change in the second half and we got caught and Barcelona being as clinical and efficient, as Arsene Wenger had said pre match, took advantage and scored. What was surprising was Wenger was quite direct in his press conference post game and without naming names, was critical of his side. A journalist described him as ‘Measured but clear’ in what he said. For me, yesterday was about enjoyment but Sunday will be full of stress – it’s the game that really matters in my eyes. Winning at Old Trafford when they are struggling is essential; look ahead to our away fixtures at Spurs and Manchester City and you can add Everton and West Ham and you see why our away form may be vital in deciding if Arsenal do end the season as champions. Old Trafford holds some painful memories in recent years but our last two visits have actually been quite positive. A draw in the league and a victory in the FA Cup last season represented us being unbeaten in two matches there. We will also be going with a motivated Danny Welbeck who looked lively as he came on off the bench against Barcelona. Arsenal certainly need Alexis Sanchez to have a game and start playing again; our best player from last season hasn’t quite hit the heights since returning from his injury but you would think if Arsenal were going to win the league, Alexis has to step up now. Roll on to Old Trafford.